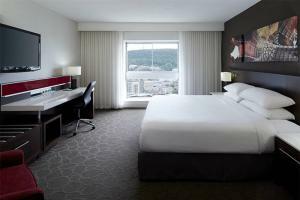 Located just steps away from the Quartier des Spectacles, Montreal's Entertainment District, Delta Hotels Montreal embraces a simplified hotel experience. 456 stylish and modern guest rooms, most with a balconies and views of the city, offer a comfortable and convenient retreat. The hotel features communal tables in its common areas, perfect for collaborating and socializing. Enjoy a fantastic meal at the bistro bar, Le Cordial, featuring a Quebec-inspired menu that showcases local produce, and a list of creative cocktails and microbrewery beer selections. Located in Montreal's Entertainment District, approximately 13 miles from Montreal-Pierre Elliott Trudeau International Airport. Le Cordial - bistro bar.